How long does it take to run a race? Anywhere from 30 minutes to an hour, depending on the length of the race. Short track and road races take less time, 500 mile super-speedway races take more time. Can I create my own drivers? At this time, the card-creation instructions have not been published. 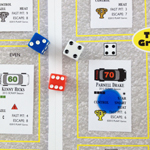 There is a user-created guide for creating fictional drivers, available for free download. How long has this game been around? RED WHITE & BLUE RACIN' was introduced in Feburary of 2012. Race season card sets range in price from $12 to $24, based largely on the number of drivers in the set. If you're a fan of big-time pro stock car racing, you already KNOW how addictive this sport is! Well, imagine--being able to have big-time pro stock car action whenever you WANT! Middle of the week, middle of the NIGHT--anytime, anywhere! "Run for fun," or conduct your own full pro race season, with as many events as you like. Keep track of points, standings--watch as drivers jockey for YOUR championship! This game lets you DO all that--and MORE! And while pro racing sports game "die-hards" will love RED WHITE & BLUE RACIN', it's also a great experience for the stock car racing novice! For anyone who's ever watched a big-time pro stock car race on TV and thought, "Um--how is THIS exciting?" --this game will SHOW you! 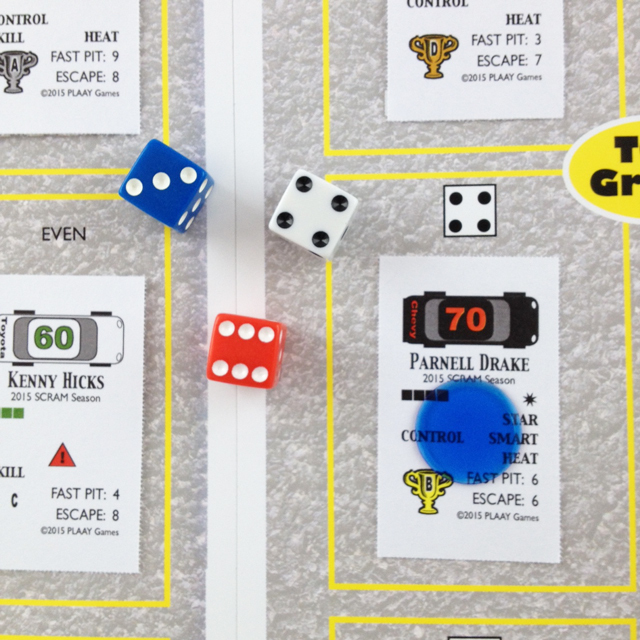 But be forewarned--playing this board game just might turn you into a pro racing fanatic! 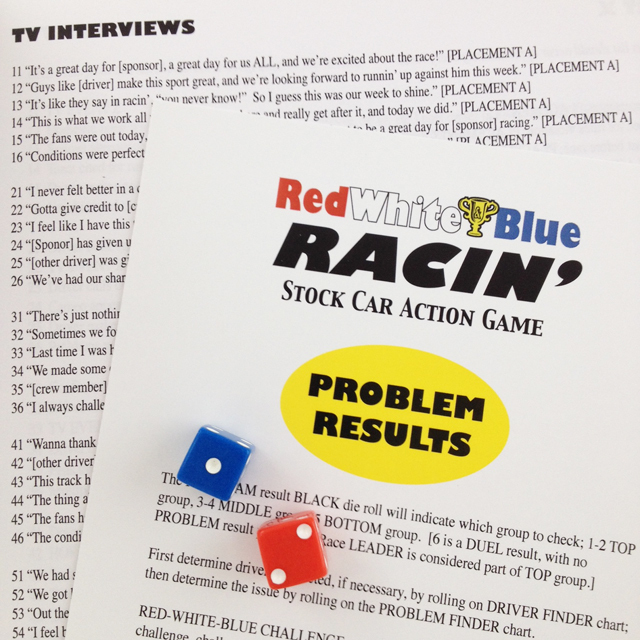 RED WHITE & BLUE RACIN' sports simulation board game offers a unique way of re-creating a pro stock car race. Instead of tediously checking every car, every lap, the game uses a "highlight reel" method of generating exciting race action. You get right to "good stuff!" NO moving cars space-by-space around a cardboard track. ("THAT ain't stock car racin'!") NO math exercises or constant index calculations and re-calculations--this game is NOT about crunching numbers. It's about high-octane thrills and super-charged race day drama! The result? A full race in as little as 45 minutes, packed with everything fans love about big-time pro stock car racing! And when we say "everything," we mean EVERYTHING. Wrecks, spin-outs, equipment problems, duels, frantic pit stops, driver feuds and story-line elements. You'll "see" first-hand late-race histrionics, epic victories, crushing collapses, and everything in between! With RED WHITE & BLUE RACIN' you'll get the COMPLETE stock car racing experience. That means RARE events will happen, too! A couple times a season, you might have a race shortened because of bad weather. Drivers will occasionally get "black flagged." There'll be once-in-a-blue-moon track repair issues, fan incidents, events where a driver suffers an injury. These won't happen often--some events, you'll likely NEVER have happen. But you'll be kept on the edge of your chair sometimes, knowing that they COULD! RED WHITE & BLUE RACIN' is designed to be incredibly REALISTIC. Each driver gets his own, unique card that realistically reflects his actual driving tendencies and performance. You'll be delighted--and sometimes astonished!--to see that your race results are just like what you'd find on the all-sports network wrap-up reports! 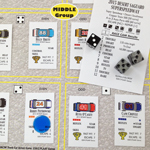 The top drivers will dominate your table-top, while the third-tier guys struggle just to qualify. The drivers in the middle will have their moments, good and bad. Yes, you'll have your "Cinderella" stories--non-descript drivers who come out of nowhere to take an unexpected checkered flag. But they're infrequent enough that they'll be among your memorable table-top sports hobby moments. Not just the drivers are rated--also the tracks! You get a set of racing venue cards along with every available driver card set. Just like in real-life, some tracks are tough on cars, others are more "driver friendly." Similarly, you'll find some drivers perform better on the short tracks, others on super speedways. Of course, the super stars do well most EVERYWHERE! And some of the "fringe" drivers will have a tough time earning points on ANY track. But no matter WHAT the assortment or order of drivers, you can count on THIS: a race at a legendary east-coast short-track will give you a very different table-top experience than a race at an iconic southern super-speedway! Just like it would in REAL stock car racing! And then there's RED WHITE & BLUE RACIN's Race Week. 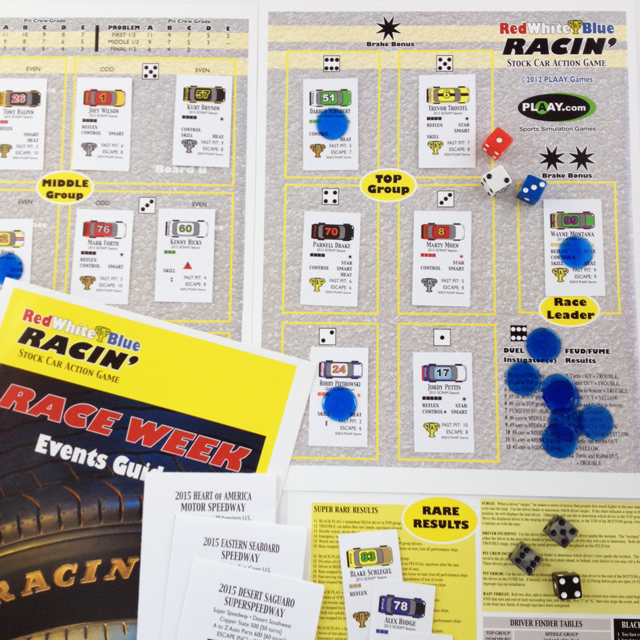 While most stock car board games begin with the green flag that starts the race, RED WHITE & BLUE RACIN' starts with the week leading UP to the race! Events of the week have an impact on race day. You'll experience qualifying accidents and heroics, celebrity interaction and local happenings that affect the race. Your favorite driver might get a "boost" from a big sponsor announcement, or an appearance on a national sports show. Or, he might get into an altercation with another driver, or alienate his fans with some poorly-chosen words--to the detriment of his performance! Of course, many drivers will quietly get their business done with NO attention drawn--that, too, is a part of Race Week. RWB's one-of-a-kind "Race Week" procedure ensures that EVERY race has a DIFFERENT "feel" to it, even if it's run on the same track. It's designed to make qualifying just as intriguing and fun as running the race itself! RED WHITE & BLUE RACIN' was designed to be played solitaire--with you, the stock car racing fan, enjoying an experience similar to watching a race unfold on TV, or in the grandstand. 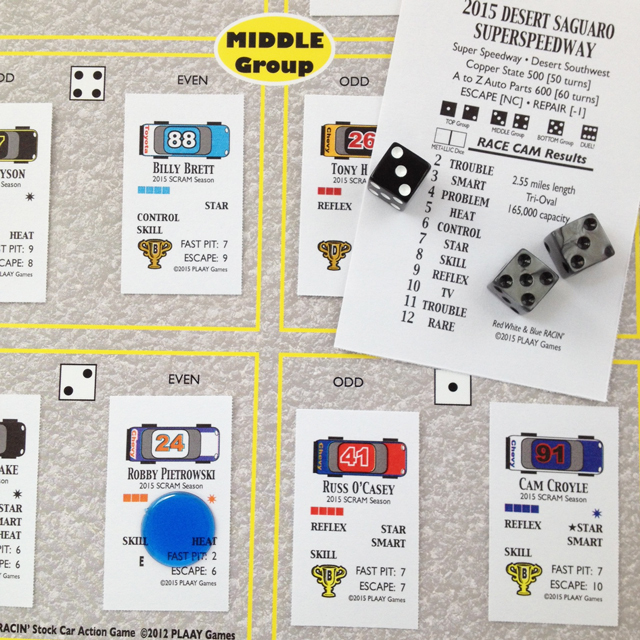 However, it can also be played with multiple players, each assuming the role of crew chief for his favorite driver! There's a special section of optional/advanced rules for multi-person play--just be aware that we're not responsible for any punches that might get thrown during the heat of battle! RED WHITE & BLUE RACIN' offers an assortment of different stock car experiences. The game comes with an "all star" set of driver cards representing stars of the past decade. For an additional charge, you can purchase a set of cards based specifically on last year's racing season, including everyone from the champion in the point standings to drivers who ran only a couple of races, and track cards for every racing venue at which a points race was held. There are also "decade stars" sets from the '70s, '80s and '90s, allowing you to revive memories of racing's exciting past. Or create your OWN pro racing universe with a card set from our fictional pro stock car circuit, Stock Car Racing America--or SCRAM for short! Heard enough? Get the game! Got questions? 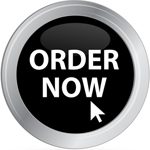 We're happy to help--just e-mail us!